What do people do with their history degrees? 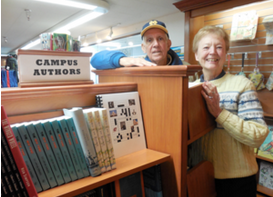 Mary Ellen Wynes responded, “Write cross word puzzles!” Mary Ellen and her husband Jim, both CMU alums, created and published a history crossword puzzle book. Jim, who received his masters in history in 1965, has remained a student of history over the course of his life. Jim wants people to learn while solving the puzzles, and Mary Ellen offers the friendly warning that it really is designed to challenge history scholars. The clues are devised for someone who has great familiarity with history, and the book covers a wide range of topics from Imperial Russia to military history to early television to Michigan and even CMU history. And that’s naming just a few of many categories. Seems like great productive procrastinating for grad students and faculty alike. The book is available at the CMU Bookstore in the Bovee University Center or you can order via email at historycrosswords@gmail.com. Cost is $11.95.